for quality and value. 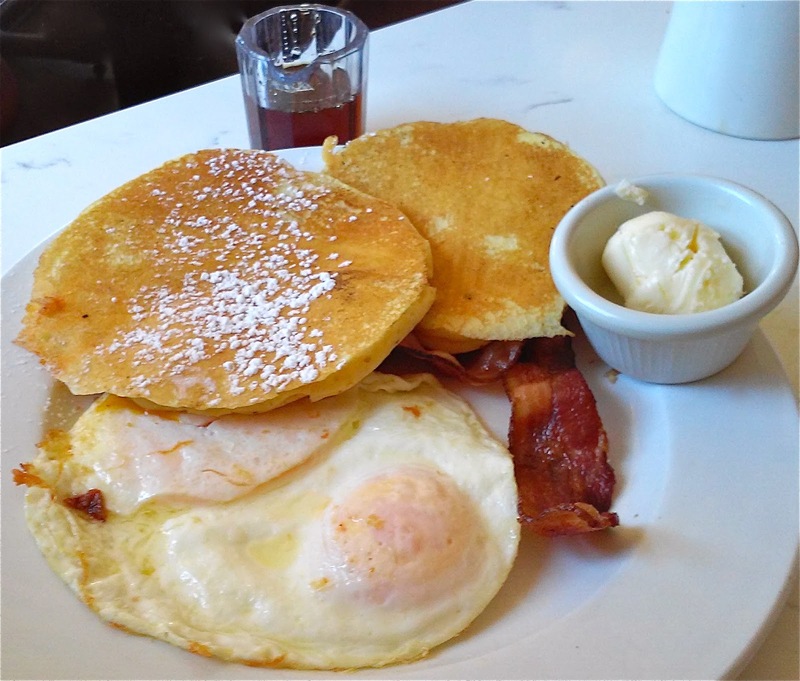 2 eggs, and 2 pancakes, bacon, sausage or ham, $9.50. I visited Liz's Cafe, Anybody's Bar, the new restaurant at 31 Bradford Street, on the Fourth of July, which is a challenging day for any PTown restaurant, let alone for one just getting started on its first season. The place was absolutely packed and the staff was bustling. Chefs from one of the town's best-known dinner hot spots were there that day, having breakfast with friends, which is always a good sign. It definitely pays to eat where chefs eat. They were having a scramble of eggs and veggies, which looked quite good. related to 1950s founder Ernest L. Carreiro, who had emigrated from the Azores? Liz is Liz Lovati, of Angel Foods fame, so she knows something about good food. Liz has a section on her breakfast menu paying tribute to the old Tip For Tops'n restaurant, which was handed down through the Carreiro family, who ran it on this spot from about 1966 to 2013. The odd moniker stood for "Tip of the Cape for Tops in Service," and they were well-known for their breakfast specials. Liz chose three of those for her new menu. The old #2 breakfast is shown at the top of the page, but with a new benefit: Liz serves real maple syrup from Vermont with her flippers (Portuguese fried dough,) pancakes, and French toast. This great, hearty breakfast of eggs, pancakes and bacon (choose ham or sausage, if you'd like) for $9.50, earns Liz's Cafe a Best Bite award from TheYearRounder. stood where Galeforce bikes stands today, just a few blocks down Bradford Street. By the way, the name Liz's Cafe, Anybody's Bar, reaches even farther back into PTown history, to Ernest L. Carreiro, an earlier émigré from the Azores, who ran Anybody's Market at 31 Commercial Street, dating back to at least 1942, when the photo on the left was taken. 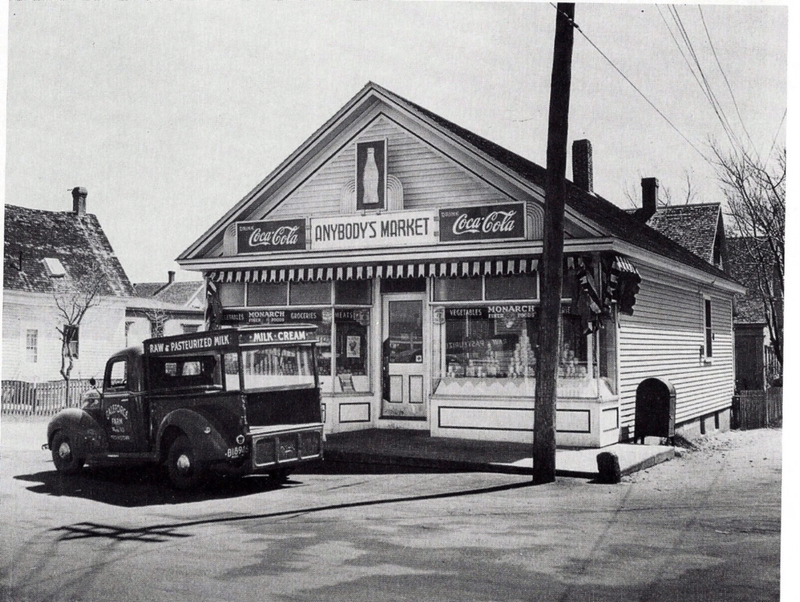 In the 1950s, Ernest shifted to the restaurant business in the same building, according to David W. Dunlap, on his wonderful, historical blog Building Provincetown. Dunlap tells us that Edward C. "Babe" Carriero, hailing from New Bedford, took over the restaurant in about 1966, running it with his wife, Eva (Cook) Carreiro. 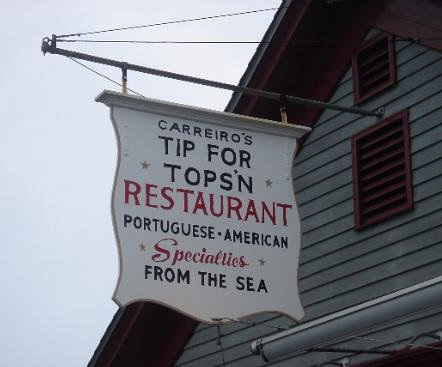 From there the restaurant was passed on to sons Joseph C. and Gerald E. Carreiro. I'm not certain that the first Carreiro here was related to all the others that followed, but that clan was definitely related to one another, with kids growing up in the restaurant, and family all around. old Tip For Tops'n. Photo by Yelp reviewer Stephen T.
Years ago I was told by Joyce Carreiro, who had married Gerald and who often greeted and seated me at Tip For Tops'n, that the old store had been a true neighborhood market, stocking a fairly wide variety of merchandise. Apparently, at Anybody's Market, you could get anything from groceries to a new tire for your bicycle, or maybe even one for your car. Devon's restaurant, here for four years, kept a bit of Tip's decor, but Liz's dining room has evolved with a new look, stylish and comfortable. But let's get back to the food! Liz offers six omelets and scrambles. Try the linguiça (say leen•gwee•suh,) a Portuguese sausage, or the vegan scrambler, along with several versions of eggs Benedict. I can't wait to try the chicken and waffles. spinach, and red onion, served with white or multigrain toast and home fries. 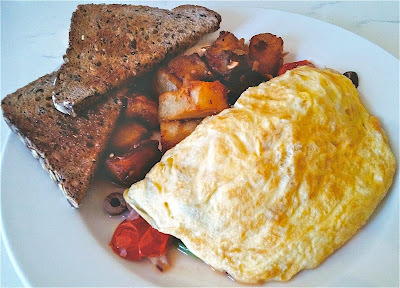 My Greek omelet was a generous size, full of Greek flavors like feta and Kalamata olives, with spinach, tomatoes and red onion. 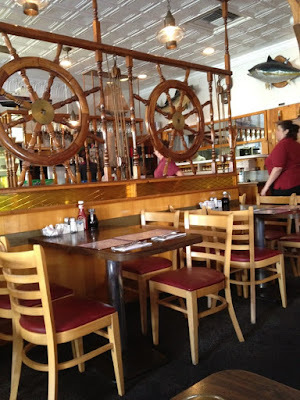 It was served with home fries and my choice of white or multigrain toast, with a pot of jam on the table. The service was quite good. 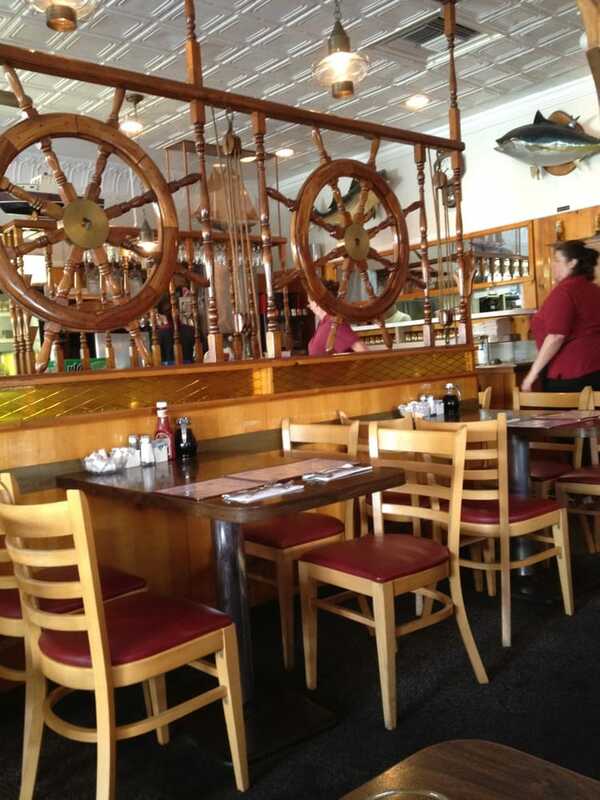 My waiter kept his composure when I sent back my too-dark toast, in the middle of the July 4th breakfast rush. God love him, and the kitchen staff as well. They made me happy with my meal. Lunch offerings are homemade soups, salads, sandwiches, and a signature burger, and I think we'll see favorites like Angel's Italian sandwich on the menu. There's talk of special chicken wings, and I'm holding out for a Jamaican dish or two, which this crew does so well, having run One Love restaurant near the pier, and in the Gifford House. The menus are still evolving, even as I'm writing this, and there's likely to be a bar menu, too. The staff is tweaking and tuning up as they figure out the finer points of serving really good food all day long. Breakfast runs from 8 AM till 2 PM, lunch from 11 AM till 2 PM. Dinner is currently served from 6 PM till around 8 or 9 PM, subject to demand. Call 508•413•9131 to keep up with any changes that might be necessary as they settle into a groove and hit their stride. Dinner is a three-course, prix fixe menu, changing daily, offering soup or salad, a choice of three entrées, and dessert, for $30. Recent selections have included a Chicken Française and a fillet of sole. There's also a full service bar, and, unheard of in Provincetown, parking in a small lot right on the property. This new incarnation of a favorite restaurant is a great addition to the dining scene in Provincetown's quiet West End. Give 'em a whirl. Hi, Will. Thanks for reading my blog. This post evolved overnight, as I got some new information, and dug up some more old photos. I hope folks who might have read this yesterday will read it again. Cheers!